How much flying we get during the UK winter varies considerably from year to year. Some years there’s very little flying to be had from November through to February due to unrelenting low pressure systems bringing wet and windy weather. Other winters we fly a lot. This is usually when high pressure is more often in charge, blessing us with drier – although often colder – weather and lighter winds. The only thermals we find tend to be the kind we might wear, rather than the ones we’d like to lift us skywards. But despite the weak solar heating, thermic winter days do exist! The trick is to spot such a special day coming, then to know where to go, and when, so you don’t spend hours waiting in a chilly breeze. 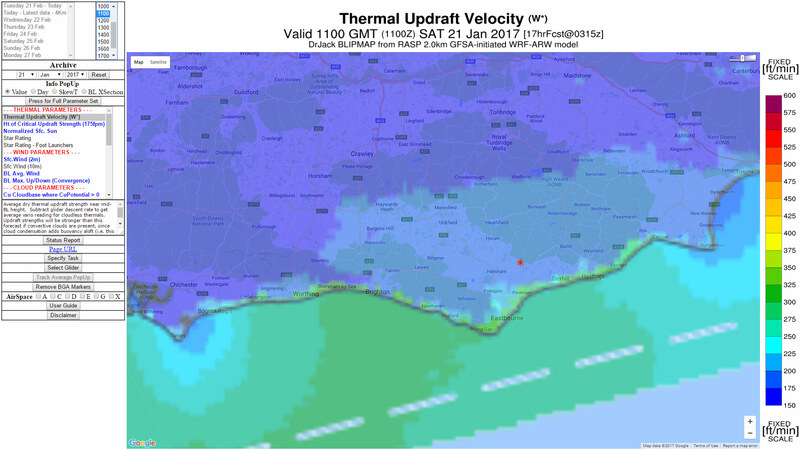 The soaring weather forecasts for Saturday 21 January 2017 were looking good for flying in the south east of England. The wind strength was forecast to be a bit strong for full-size paragliders to start then easing to soarable levels from around midday. The wind direction was forecast to start E, or even ENE more inland, but soon veered to SE in the afternoon, going more south at the end of the day. So, looking good for Southern High & Over or Beachy Head near Eastbourne. 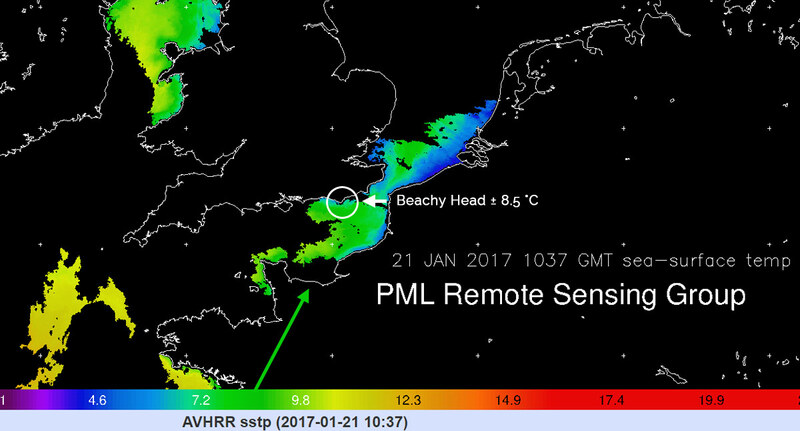 RASP predicted some gentle thermic activity, especially along the coast, and out to sea. Thermals, in winter? 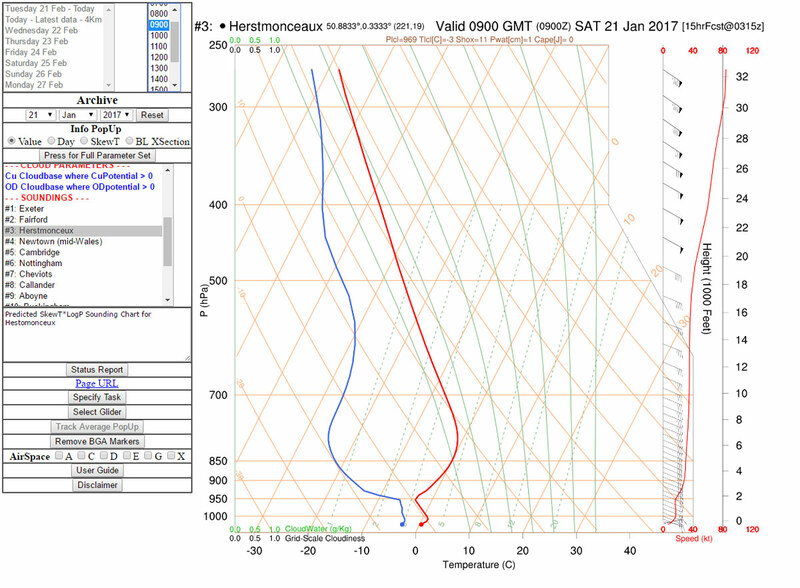 The 9am RASP sounding forecast for Herstmonceux (the red station near Hailsham) showed two important temperature inversions. The first was the common low-level inversion that often forms near the ground during the winter (anything from a hundred to about a thousand feet deep). This forms because the cold ground cools the layer of air above it overnight, and is often more pronounced on clear nights. This ground inversion (the lowest kink in the red line) was expected to warm through by about 10 am. The lapse rate up to 2,000 ft follows the dry adiabat (it slopes the same as the orange grid lines, cooling at approximately 3°C for every 1,000 ft) so it is unstable, leading up to a marked second inversion. If we could find a thermal, we might climb as high as 2,000 ft.
With clear skies overnight and a marked frost in the morning, it was pretty chilly on the ground. The day started breezy so we flew our Niviuk Roller miniwings. 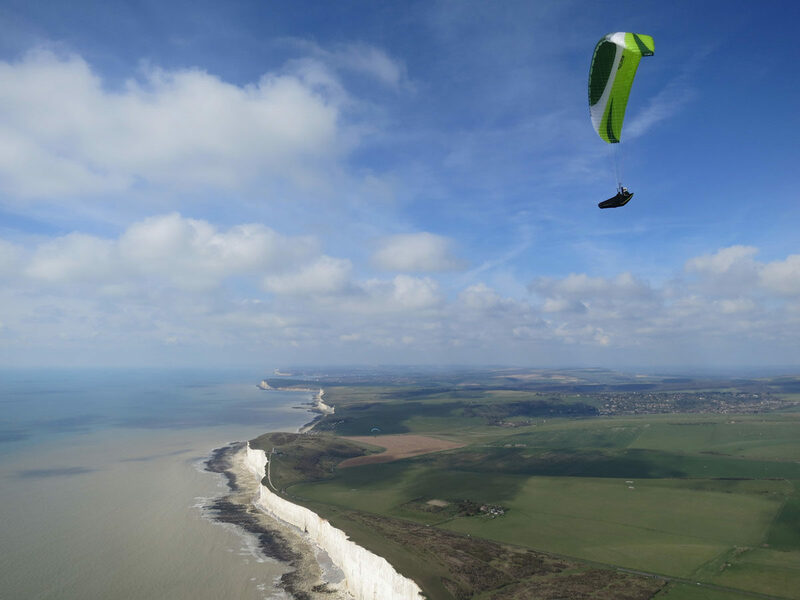 They are so much fun, and safer than full size paragliders in those kinds of conditions! Then the wind calmed, and it became beautifully sunny, so we took out some new wings from our demo fleet. Flying along the cliffs the air was noticeably buoyant. But out over the sea big gaggles of gulls were climbing even better. Over the sea? How could that be? Taking a look at the sea temperature, we can see it was being influenced by a warm ocean current (± 8.5°C), which creates a layer of warm air above it. Sea surface temperature is an average: as the water swirls, pockets of warmer water appear at the surface between cooler areas, so we might see 10°C in some places, significantly more than the inland trigger temperature of 5°C. Slowly, patches of air begin to warm, becoming thermals. The air only needs to be a few degrees warmer than the surrounding air for it to become buoyant and start to rise. Behold, the sea thermal. Being of high humidity and only slightly warmer than its surrounds, it is usually soft-edged, wide and gentle, requiring a subtle thermaling technique – what Kelly Farina might call the micro-screwdriver in a pilot’s tool bag (in his excellent book Mastering Paragliding). The lift is weak. Keep your turns really flat, flying at minimum sink (a little brake on) and trying to feel the very subtle movements of the wing to give you hints of where to explore. Cranking turns on ‘the core’ will not work, this is too aggressive and gives you a sink rate penalty. You might see pilots used to strong mountain conditions struggling here, whereas the ‘coastal wafters’ with gentle inputs will rise to the top. Really relax in your harness and sense the subtle nuances. The lift is often formed in streams in these conditions, allowing you to explore a long way upwind on ‘lifty lines’. Look out for the highest pilots and try to follow directly on their line. To get the best out of the wide, gentle lift, use your vario averager and pay less attention to the immediate (audio) signal. What is your averager set on? Many pilots don’t know! It’s important to set this up on your instrument to correspond to a half turn, so you can see which way to shift your circle. 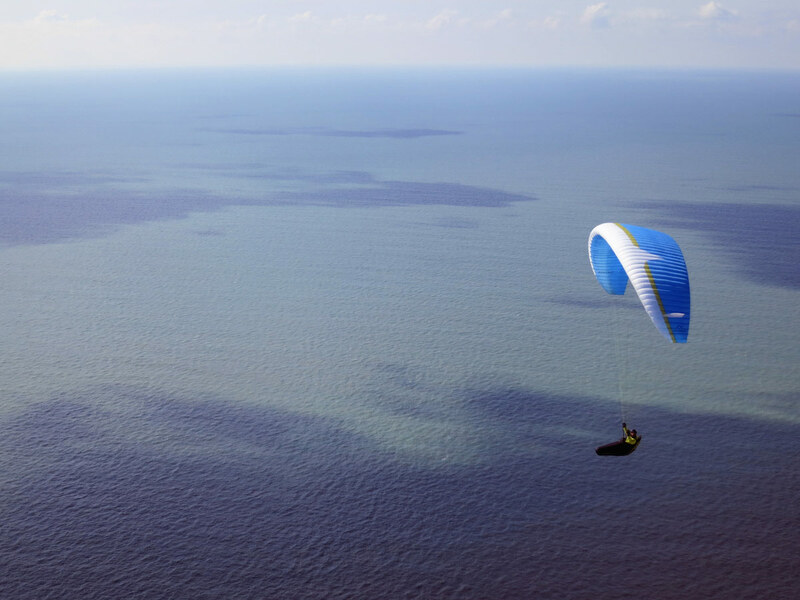 8 seconds will give you a good starting point for most conditions, 10 seconds for this kind of smooth coastal flying. 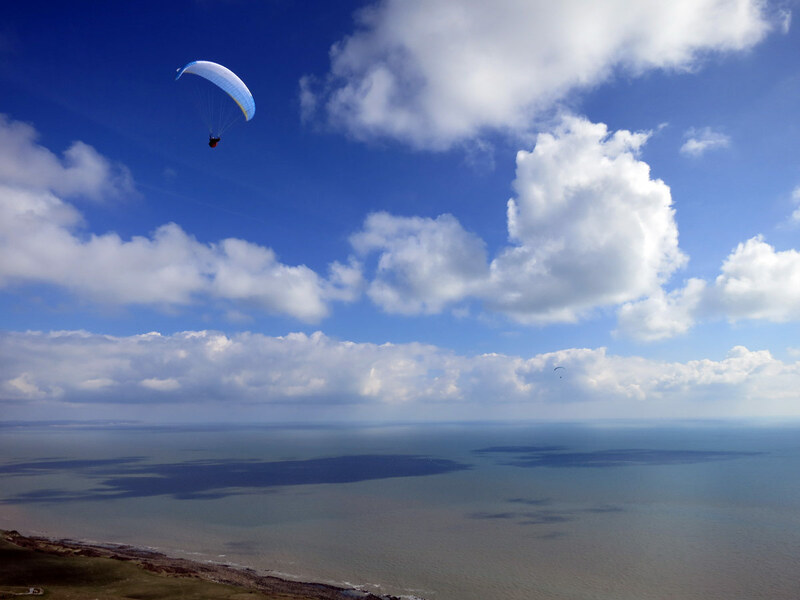 Although it is tempting to explore out to sea in the hope of finding better lift, the best thermals in these conditions are usually near the transition between land and sea. When the thermals drift against the sun-drenched cliffs, they receive a boost of warm air to increase their upward velocity. In winter, the low angle of the sun is more effective at warming the rock than usual because it strikes the cliff almost perpendicularly. Unfortunately in the case of Beachy Head with its cliffs of white chalk, they don’t heat up much. As this augmented thermal clears the top of the cliffs and drifts slightly inland on the plateau it nears the cooled inland air, and so gets a boost from the difference in temperature. This effect is prolonged if the inland air is drifting towards the coast. The sun angle, soggy grass and frost delay ground warming too. When you get up high in these conditions, is it worth going cross country inland? 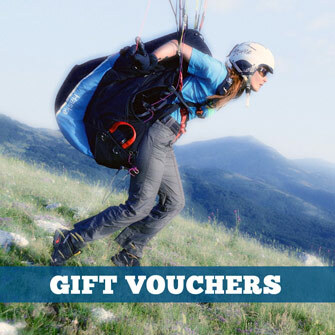 Possibly, but an out and return along the coast might be best, keeping yourself in the best flying conditions. If you aim inland, be sure to stick to the high ground. Once you lose the warming influence of the sea, the thermals will struggle to form, and any shaded slopes will create ground inversions.